Oxford Green Watch has been advised that neighbours to the Lafarge operation in the Township of Zorra have received a Notice to all Landowners of Nearby Lands and Interested Parties regarding Lafarge’s appeal of Environmental Penalty Orders that the Ministry of the Environment and Climate Change has charged the company with. The public is invited to attend the Environmental Review Tribunal (ERT) Pre-Hearing Conference on these matters. The information shared here by Oxford Green Watch is presented in good faith, to the best of our knowledge. Requests for information about the Pre-hearing Conference and how to participate should be sent to the ERT Case Coordinator noted in the Notice as Eva Carta. She can be reached by phone at 416-314-4712, or via email Eva.carta@ontario.ca. Proceeding Commenced Under section 140(1) of the Environmental Protection Act. Anyone wishing to participate in the eventual hearing must attend the Pre-hearing Conference on July 12th in order to make a request to seek status to participate as either a Presenter, Participant, or Party. The Tribunal has a document outlining the rights and responsibilities of each type of participant on their website: http://elto.gov.on.ca/ert/ titled the Rules of Practice and Practice Directions of the Environmental Review Tribunal. If you wish to attend the hearing as an observer only, you do not have to contact the ERT Case Coordinator, or make a request at the Pre-hearing Conference. Please read the full Notice of Pre-Hearing Conference for more information. 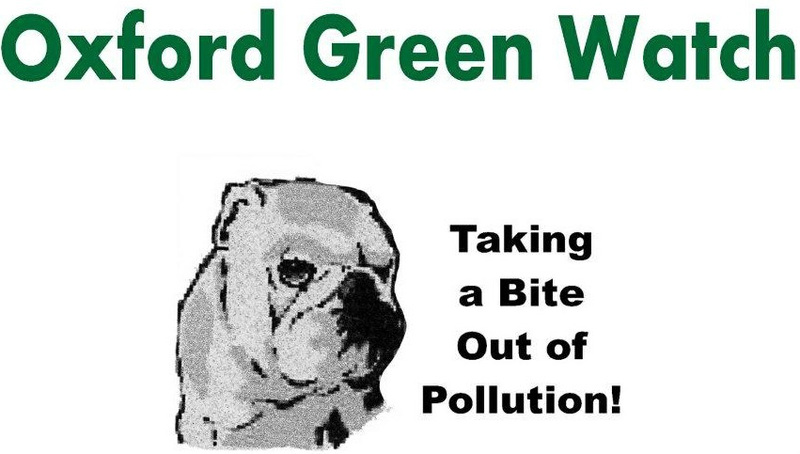 Oxford Green Watch is launching its revised webpage with the purpose of educating the public on how we have come to fighting the dump. This is not the first time that citizens groups have had to organize in the Embro, Beachville, and Ingersoll triangle to stop private interests from outside our communities from using our area as a dump site. During the 70's citizens in the Thames River Valley fought the dumping of dangerous industrial tailings in a local pit. This group was successful in protecting the ecological integrity of the valley by defeating the deep pockets of industry. 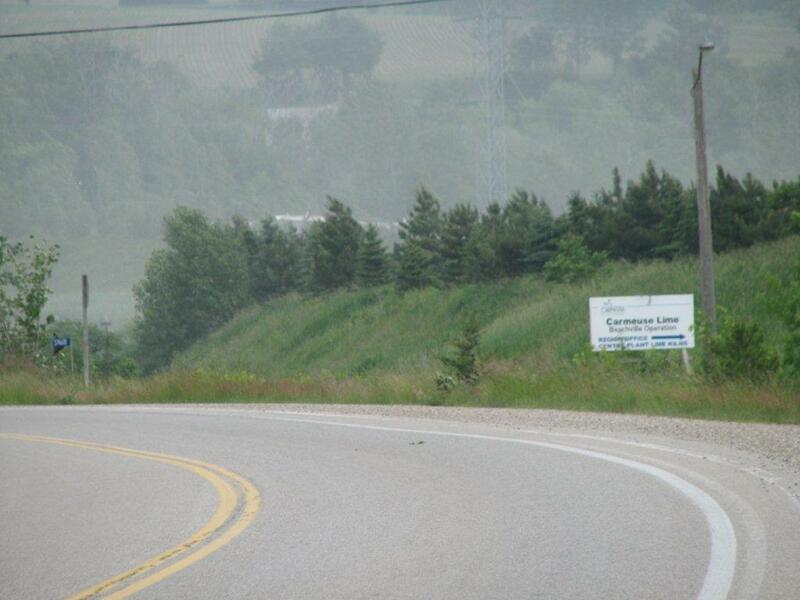 During the 1970's Embro Citizens fought and prevented tire burning at a local cement company. The citizens again successfully argued that the industry did not have the technology to do the job safely. During the 1990's another local group, Citizens for a Greener Oxford, successfully prevented the rezoning of over 640 acres of prime farmland to aggregate extraction, keeping this land in valuable food production, and so, from becoming potential future dump sites. Lobbying by citizens in Zorra Township during the 1990's successfully defended vast amounts of prime farmland from quick rezoning to mining. These lands now show on County maps as quarry resource where farming still occurs, but not as active quarry area. The proposed dump is slated for the quarry area. Citizens need to understand our history to understand why we are facing this dump issue. We need to connect the broad strokes of our history to help the County and the Province to understand why provincial inaction means we still have these issues today. Outside interests see Zorra and Oxford County as perfect dumping grounds. 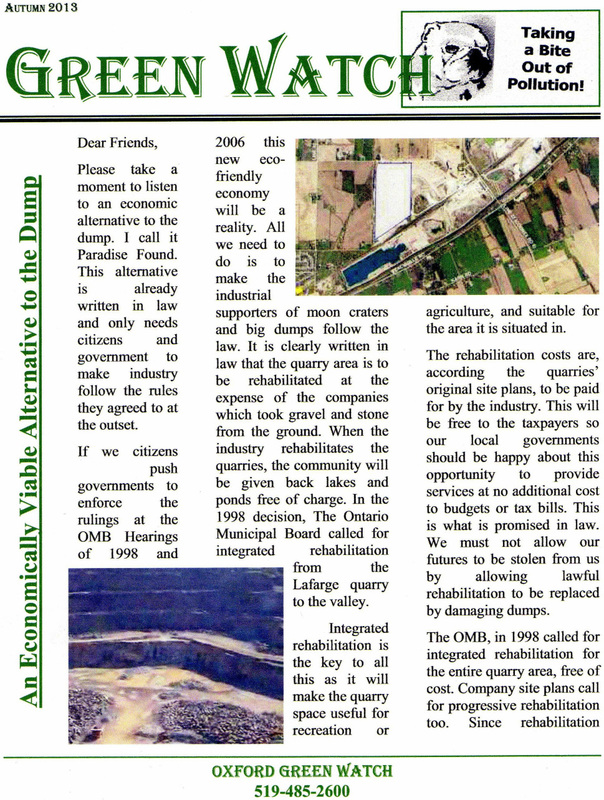 During the 1990's citizens fought and won through OMB Hearings binding legal requirements that the quarry area be rehabilitated to farmland and recreational use. History and law tell us that Oxford Green Watch must fight to protect citizens' rights by ensuring these laws are followed. Oxford Green Watch proposes A People's Vision which calls for the establishment of one of the greatest recreational areas in the world. We would insert a third pillar of sustainable economic growth to link Tillsonburg to Stratford in creating a tourist paradise. This Paradise Found will benefit all of Ontario. Stratford did it by adding parkland and a theatre festival to their industrial mix. 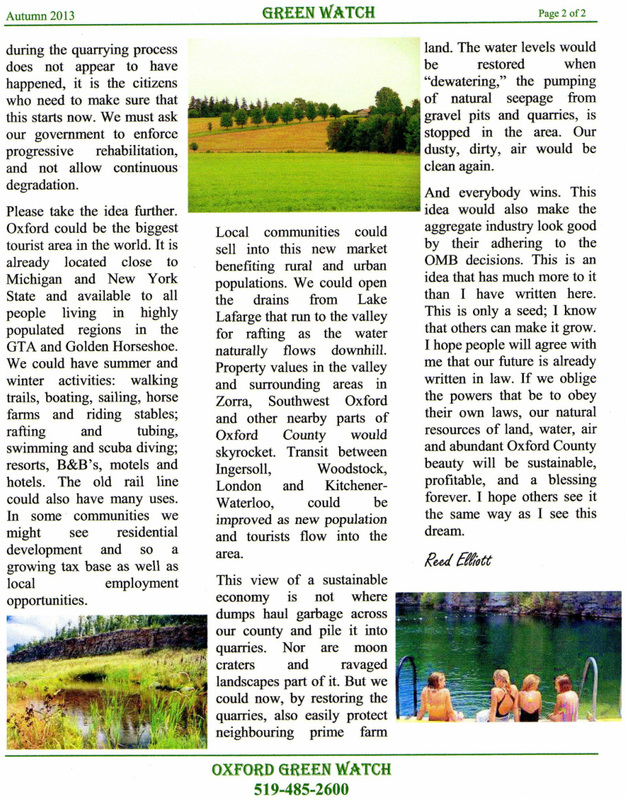 Oxford can do it with agri-tourism and recreation. Oxford Green Watch believes past and current Provincial and County planning policies are at the heart of bringing dumps to Zorra Township in Oxford County. 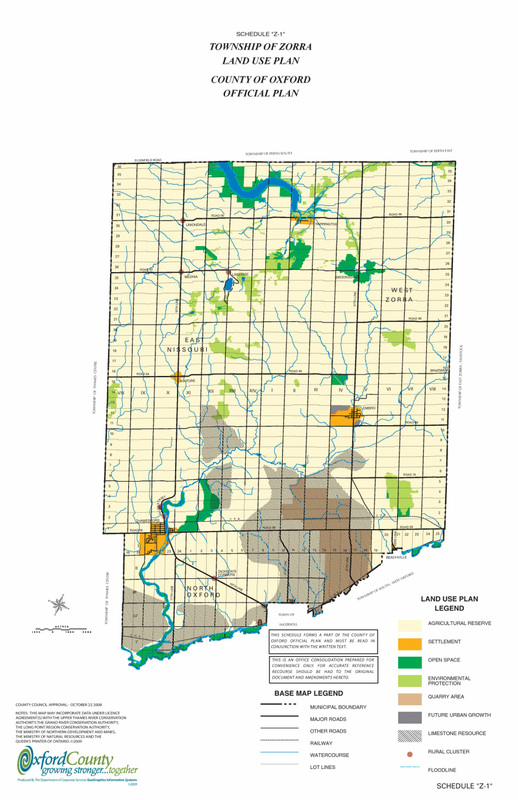 The Town of Zorra Land Use Plan in the County of Oxford County Official Plan shows thousands of acres of prime farmland slated for mining as gravel pits and stone quarries. What kind of message does this send to the rest of the world about Oxford County's values? This is the kind of prime farmland and water resources that countries go to war over. The map shows in the darker brown the quarry area where extraction is allowed to take place. Under the OMB Hearings of 1998 and 2006 this land is to be rehabilitated to agricultural and recreational use. To date, the province has not enforced their regulations for rehabilitation thereby allowing for the progressive degradation of the countryside. As the countryside is stripped of its valuable soil, it become more difficult for citizen groups at OMB Hearings or in the court of public opinion to ward off the expansion of mining and possible future dumps. Oxford Green Watch believes when governments fail to do their job, i.e, to ensure proper rehabilitation, that it causes the Oxford County countryside within the quarry area to degrade.Outside interests then see the quarry area as a perfect dumping ground. If we do not have pride in Oxford then why should they? * new quarries and dumps throughout the quarry area. Under the Official County Plan, the aggregate resource area in the lighter grey on the Land Use Map can be easily added to the quarry designation i.e., the dark brown area, for new and bigger dumps. This can eventually lead to the entire quarry and aggregate resource areas becoming the world's largest dump. Government must start now to enforce their own laws by calling for immediate progressive rehabilitation in the quarry area. The MNR and MOE need to fulfilled their roles as overseers providing open and transparent reporting to the public. Public input is essential during the period when the quarry area is being rehabilitated to agricultural and recreational use. 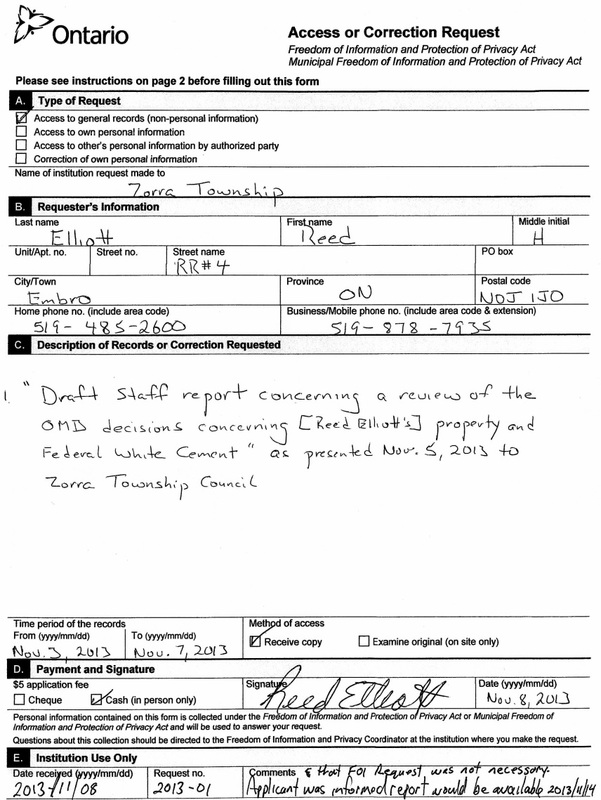 The Township Of Zorra Land Use Plan map in schedule "Z-1" shows where prime farmland could be mined and replaced with dumps. Oxford Green Watch believes in a process of education to make A People's Vision a reality. Oxford Green Watch, working closely with its alliance partners and with CLC member Mike Farlow, established a team to present our position to all local councils. This team of speakers will make itself available for presentations to other groups in the area. Oxford Green Watch expresses our gratitude to Suzanne Crellin, VP of Transition to Less Waste for her technical expertise, speaking and research skills in creating our PowerPoint presentation to all Oxford County Councils. Oxford Green Watch expresses our gratitude to Bryan Smith Chair of the Oxford Coalition for his help in research, organization and skills in speaking to all the councils. The Oxford Coalition for Social justice was instrumental in helping Oxford Green Watch reestablish itself in Zorra. Oxford Green Watch expresses our gratitude to Mike Farlow for his presentations with our team to all municipal councils in Oxford. Oxford Green Watch expresses our gratitude to Mike Farlow in drawing attention to future recreational lakes on site plans in Oxford through his fishing experiences in Lake Farlow. Oxford Green Watch believes that citizens living near current quarries and gravel pit operations should apply for property value reassessment. An Oxford Green Watch member from Zorra Township applied successfully to have his property tax reduced as he lives within vicinity of quarrying. Municipalities need to understand that allowing quarries with the expectations that they will eventually become dumps or dump-related industries is a no-win solution. Dumps may result in further devaluations and appeals of taxation. Oxford Green Watch understands that citizens gaining tax reductions near quarries will pass the costs onto ratepayers in other parts of Oxford County. In addition to this many aggregate operations are asking for reductions in their taxes and royalties, displacing costs that will need to be picked up by someone. 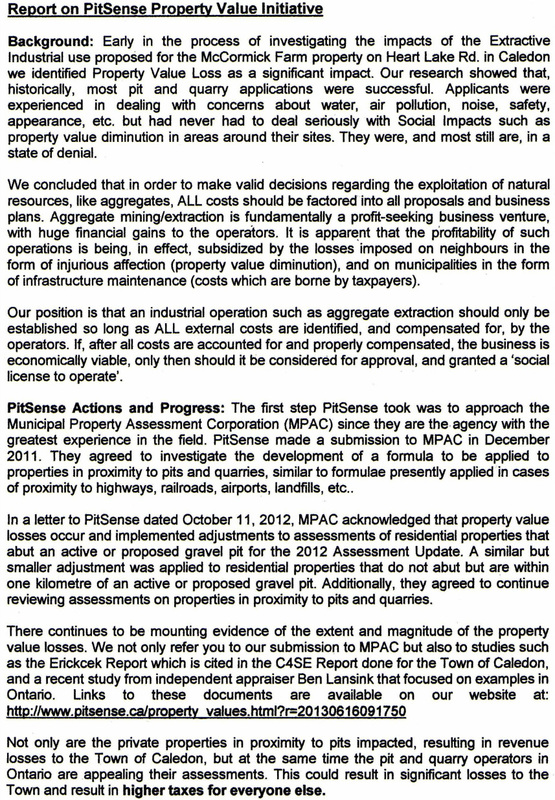 PitSense is a community of people organized to respond to proposals for further increases in the number of gravel pit and quarry operations in Caledon. They are opposed to the continuing 'Domino Effect' growth of open pit mining in the agricultural and rural residential areas of the Niagara Escarpment and UNESCO World Biosphere Reserve. They are engaged cooperatively with similar groups around the province. Oxford Green Watch sees the economic solution to our falling tax base and precarious incomes in a powerful agro-tourism industry in an area linking Stratford to Tillsonburg. Please feel free to print and share this educational, community-friendly leaflet with others. Oxford Green Watch knows that aggregate pits and quarries are supposed to be interim, temporary land uses and have a commitment in writing to rehabilitate the land to work with or as agricultural land. Taking land out of production temporarily while rock and stone is removed, restricts production of food for the short term. Nothing in the site plans, however, permits removing these lands permanently from food production, which would be the case if dumps are permitted in pits and quarries. Additionally, dump contents put food and water at risk forever. An attack on prime farmland, is an attack on the food and water necessary for all people, rural and urban. Reed Elliott's ﻿second ﻿submisson to MOE in oppostion to dump.